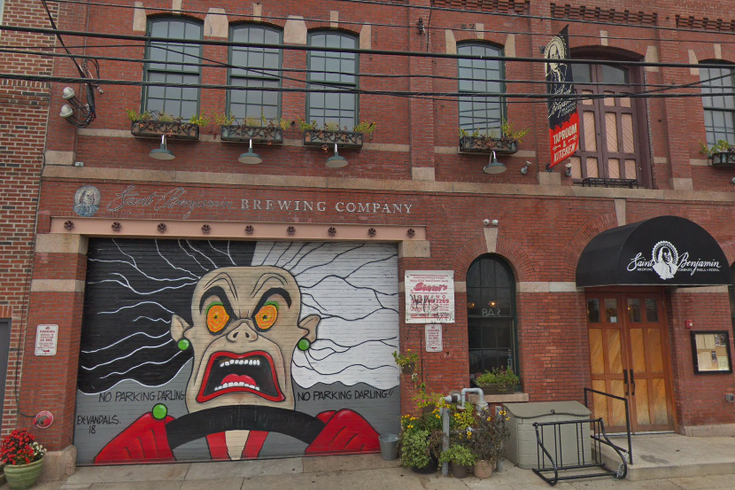 This screen capture shows the exterior of St. Benjamin's Brewing Co. at 1710 N. Fifth St. in Philadelphia. The popular brewery and taproom suddenly announced it will be closing on May 4 because the building it occupies has been sold. There are no immediate plans to reopen the brewery in a new location. Saint Benjamin Brewing Co. in Kensington will close for good month on May 4. The popular brewery, started by Tim Patton and Christina Burris, announced it will be shutting down via Instagram on Monday morning. Saint Benjamin's brewery opened in 2014 and the restaurant and taproom opened in 2016. Brown also confirmed that Saint Benjamin's owner has decided to go in another direction. While both the business and building were up for sale, Patton sold the building but not the brand. The building's will convert the space into residential units. While there may be space for a restaurant in those plans, Brown said, “definitely won’t be room for another brewery. Saint Benjamin Brewing Co.'s last week will be Philly vegan week. Brown says they plan to “go out with a bang" for their May 4 closing. When it opened five years ago, Saint Benjamin Brewing Co. was among the smallest breweries in the city, in terms of beer production. By 2016 the brewery had opened its taproom and expanded its brewing systems to increase its capacity 10 fold. Saint Benjamin's canned beers are sold by distributors in Philadelphia and the surrounding suburbs, as well as in New Jersey and Delaware.